» Articles » Sharp Tips » Should I Cut Back Perennials In The Spring Or The Fall? Should I Cut Back Perennials In The Spring Or The Fall? Perennials in your garden offer a wide variety of colors, sizes, textures, and forms to work with as you create and fill in your landscape. Once planted, they require very little maintenance other than keeping them well groomed and tidy looking in their appearance. So how do we do this? Usually, a once-a-year clipping is sufficient. The question then arises as to when our perennials should be cut back--in the spring or in the fall? Probably the number one consideration in deciding when the clipping should be done is appearance. Your perennials look great during the summer growing season of course, but will they enhance the appearance of your garden throughout the course of the winter if they remain untouched by clippers or shears, or will they look like wilted brown weeds that need to be whacked down? Let’s look at some specific examples of what we’re talking about. 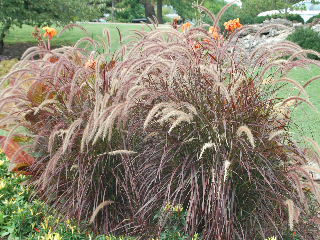 Ornamental grasses are pretty much year ‘round all-stars. Their green (and sometimes purple or red) foliage looks great growing and blowing in the summer breezes. Then the foliage turns to shades of brown as the fall frosts hit. The flowing texture remains attractive, no matter what color it is, all winter long. And the seeds are often a source of food for wild birds. 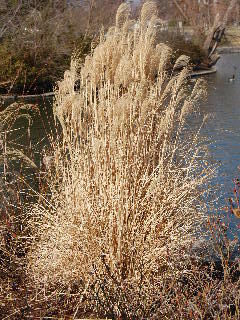 So, cut back your ornamental grasses only in the late winter or early spring just before the new season of growth is about to begin. Mums need to be cut back in the fall, also. Daylilies and iris are two other plants that benefit from a fall cut-back and clean-up, removing the dead and dying foliage which can often offer cover for the overwintering of iris borers and other pests. Most ferns and some of the more delicate non-evergreen hostas should also be cut back in the fall to keep your garden looking neat. Butterfly bush should be cut back in the early spring before new growth begins. Don’t be afraid to prune it back aggressively, to no more than 18 to 20 inches of remaining height. The new growth will come on just as aggressively as you cut back the old growth, and will give you an abundance of blooms throughout the summer. If you’re just not sure about cutting back a certain perennial in the fall or the spring, let your eyes be your guide. If it looks nice in your garden going into the fall and winter, leave it there. If it looks shabby, cut it back and mulch the site.